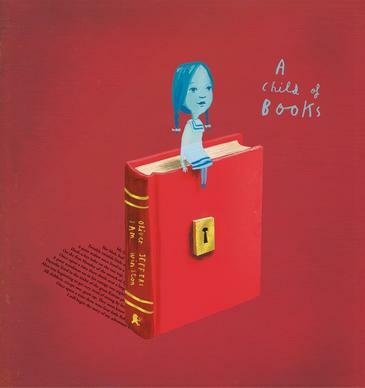 A Child of Books is a children’s picture book written by Oliver Jeffers, illustrated by Jeffers and Sam Winston and published by Walker Books (2016.) RRP: $Au27.99 HB. I have previously reviewed Jeffers’ Once Upon an Alphabet. Read Sue Stirling’s review of Jeffers’ Lost and Found here. From Oliver Jeffers and typographical fine artist, Sam Winston, comes an inspiring and lyrical picture book about a little girl who sails her raft 'across a sea of words' to arrive at the house of a small boy. There she invites him to come away with her on an adventure where they can journey through 'forests of fairy tales', 'across mountains of make-believe' and 'sleep in clouds of song'. Guided by his new friend, the boy unlocks his imagination and a lifetime of magic lies ahead of him... But who will be next? This beautiful picture book is a celebration of reading and the classic books that have provided a literary background for so many of us. The story line is simple, inviting us all to use our imaginations and explore through the power of make-believe. Winston uses typographical art - actual text from the classics, formatted in ways to suit Jeffers’ words and drawings. Parents and grandparents will have such fun identifying classics like The Wind in the Willows, Treasure Island and Black Beauty, and reminiscing with their kids. I hope this will nudge some children towards reading the classics when they are older - there’s a huge list in the end papers to get them started! While I am not sure I would choose A Child of Books to read aloud to my pre-school group, I think it’s a must for libraries everywhere because it IS a celebration of books and reading, and is truly beautiful. I would certainly love to share it with older children, especially those precious kids who already love books. I will be adding A Child of Books to my list of Picture Books that Promote Imagination. This is a lovely book. I recently purchased some picture books, not for young children, but for our teachers to be able to show our students how impactful well crafted visuals can be. It was a mixture of your recommendations and those from a blog I subscribe to, Brain Pickings, that pointed me in the direction of these beautiful books. How lovely to get your feedback! I think well-crafted visuals appeal to us all, and children's book illustrators are superb at this. But I know too how important visual literacy is for kids, and these books are another way to have kids really think about things like audience and purpose etc. This sounds like a powerful book on the imagination - I'll have to see if my library has it.